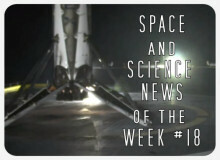 » SpaceX Scores Double Whammy with Nighttime Delivery of Japanese Comsat to Orbit and 2nd Successful Ocean Landing (Universe Today) – SpaceX does it again and this time even lands a booster that lifted a satellite into geosynchronous orbit back on the drone ship. Phil Plait has a blog post that explains why this is such an important success. » SpaceX Taps Superhero Designer For Its Spacesuits (Universe Today) – Elon Musk has reportedly engaged the services of superhero costume designer Jose Fernández for SpaceX’s own future space suits. » SpaceX’s new price chart illustrates performance cost of reusability (SpaceNews) – SpaceX has released a price chart that reveals a lot of interesting new details. » SpaceX undecided on payload for first Falcon Heavy flight (SpaceflightNow) – It’s still not known if SpaceX will fly an actual payload on the first Falcon Heavy demonstration flight, but they already have interested customers. » Astronomers have discovered the first ever comet without a tail (ScienceAlert) – A surprising Manx comet has been found, a strange ice-less hybrid between a cometary an asteroid. » Is A New Particle About To Be Announced? (Universe Today) – Speculation is rife that Cern might have found a completely new kind of particle with the LHC, but for now it’s still all rumour. » Current debate on ICBM use a throwback to the 1990s (SpaceNews) – Companies who once we’re dead against recycling ICBMs for space missions are now warming up to the idea. » ExoMars 2018 Rover Postponed to 2020 Launch (Universe Today) – Sadly, this one was seen coming from a mile away – even as the first part of ExoMars launched, there was talk of a postponement. » Boiling Water Is Carving Martian Slopes (Universe Today) – It has been established that there’s flowing water on Mars even today, but new experiments have shown that it might be boiling off in the process of forming landscape features. » Watkins named next JPL director (SpaceNews) – The Jet Propulsion Laboratory had a new director and he seems to be an ideal choice. » Starshade Prepares To Image New Earths (UniverseToday) – The Starshade concept will enable space based telescopes to look even further. » Was gravitational wave signal from a gravastar, not black holes? (New Scientist) – The gravitational wave detected last year might not have been the product of a black hole merger after all. » Where Did Planet Nine Come From? (Space.com) – Planet 9 hasn’t even been found yet, but there are already some good theories where is might have come from. » The Origins of Strange Swirls on the Moon are Coming to Light (Space.com) – The strange and unique features on the Moon could have so etching to do with its irregular magnetic field. » Universe Has Probably Hosted Many Alien Civilizations: Study (Space.com) – More a thought experiment than hard science, a new study suggests that intelligent civilizations could have arisen more commonly than we think. » Unveiled Webb Telescope Mirrors Mesmerize in ‘Golden’ Glory (Universe Today) – The covers are off and JWST is taking its final shape. » Enceladus’ Jets Selectively Power-Up Farther From Saturn (Universe Today) – The jets on Saturn’s Moon are not always spewing at the same rate and seem to get stronger the further Enceladus is from its planet.